Dubai Desi is a community driven portal where Everything Indian in Dubai is just a click away. Dubai Desi is a site for all Desis to find stuff connected to Indians working and living in Dubai. Be it news, views, happenings, movies, events, you will find Dubai Desi the most complete and updated source of focused, accurate and authentic information. Dubai Desi is powered by contributions, by readers, to the various sections of the site. We invite you to make it a central point for sharing useful information of fellow Indians. Dubai Desi will strictly focus on content related to ‘Indians’ and will grow with your feedback and suggestions. We have volunteers who write articles for the site, and also act as editors to scan each posts before publication to uphold the policies of this site. We also have a team of community workers who regularly update the information in the various sections of this site. You are welcome to volunteer. Please sign up to contribute and to comment on the posts. For some, K.V. Shamsudheen is the lifeline that brought them back to their lives from the edge of suicide. For many others, he is the guiding star that led their lives to a brighter future. All that Indian expatriate K.V. Shamsudheen does to make these wonders is lending a sympathetic ear to the depressed souls and guiding the goalless lives to a financially stable future. But the way he has been devoting his time and energy for these causes, persistently for decades, is what makes his nature of giving back to the community very special. From the time he landed here in 1970, Shamsudheen had been seeing several fellow countrymen struggling to survive once they return home for good. By the end of 1990s, he realised that the lack of financial discipline, planning, saving mentality and investment culture was the main reason for this. To tackle this and support his community members, in 2001 he registered a charitable trust in India, the Pravasi Bandhu Welfare Trust, which operated out of Sharjah. Since then, he has been constantly striving to promote financial discipline, thrift and saving culture among the Indian expats by providing free financial advice and guidance. During the Year of Giving, he wishes to train more volunteers to help the community. In 2006, he started another initiative called Sandhwanam (consolation) to counsel people with suicidal tendency and thoughts due to the high number of suicide cases being reported among Indian expats. While attending those calls, Shamsudheen realised that what plagued most of the callers was, again, their financial woes. “The biggest problem we Indian expats face is people plunging into debts. If people live according to their needs, instead of desires, and don’t fall prey to the luring offers from banks and individual lenders, they will be able to manage.” His classes focused on spreading awareness on this. In February, he completed conducting 400 financial awareness classes for free. In addition to that, he has done more than 750 live interactive programmes on a radio channel and over 400 live interactive shows on a TV channel to help community members with guidance in financial prudence. Shamsudheen said he had so far devoted more than 400 days to conduct classes all over GCC countries and India. So, what inspires him to do this unique way of social work aimed at making sure that Indian expats do not get trapped in debts and return home with empty hands? It is the end result of his classes, of course. In each class, Shamsudheen makes the participants take stock of their situation after they got employed in the GCC. Through his presentations citing real life examples, Shamsudheen said he manages to convince the participants the need for regular savings and investments to get a regular income even after returning home. He teaches them various investment opportunities available for NRIs in India, their merits, demerits, risks, investment procedures, tax implications, etc. He also makes use of the class to conduct awareness against social evils like alcoholism, cigarette smoking and dowry. But the highlight of his class is its climax. All participants are made to take a pledge to save at least 20 per cent of their salary every month. “People generally follow this and many start investments also,” he said. 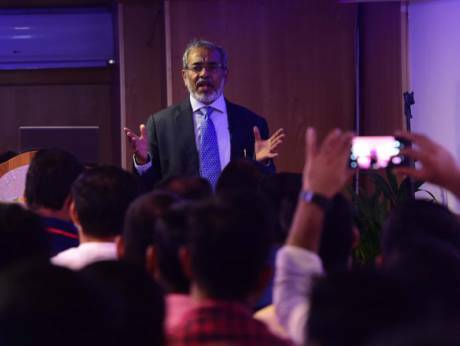 Currently a director of Barjeel Geojit Securities, Shamsudheen feels that financial awareness sessions should be an ongoing affair as long as Indian expats keep coming and going back. Since he is getting old, he has started training people to continue his mission.